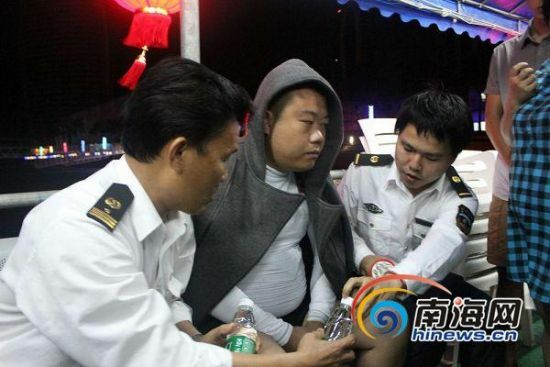 3 tourists were rescued off the waters near Jinjiling Road by Sanya Sea Rescue Sub-center at 19:00 on 17th Feb., according to the Sanya Maritime Bureau. The tourists ran into engine trouble and rough sea on the way back from their raft trip. They called for help as their inflatable boat faced the risk of overturning. Sanya Sea Rescue Sub-center reported the case to Hainan Search and Rescue Center and Sanya Emergency Office and some other relevant departments immediately after receiving the help call. At the same time, they contacted near-by boats and ships to join in the rescue. At about 20:30 in the evening, 2 tourists swam back to the shore with life jackets while the other one was found 5 miles away from Sanya Bay and rescued two hours later. Incomplete statistics show that more than 20 inflatable boat cases have been handled since the Sanya Sea Rescue Center was established less than a year ago. The changeable weather ，dangerous waters and lifesaving equipment shortage make it impossible to survive for tourists when their inflatable boats run into trouble on cruises. Sanya Sea Rescue Sub-center warns tourists to always keep safety in mind while enjoying the sea scenery.